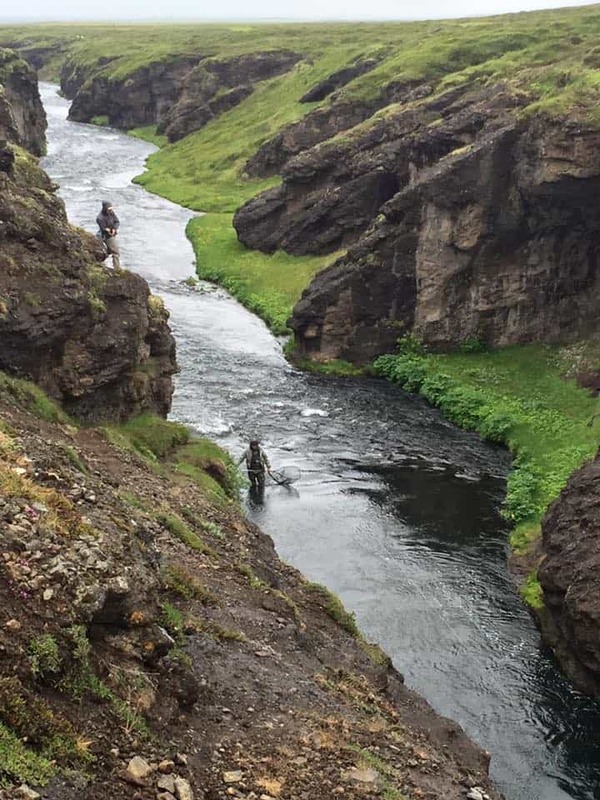 This year in June I had the opportunity to go Fishing in Iceland with a great guy Nick (whom I guided the previous year on the Tay) and his friend Hamish. Despite his name, Hamish is not Scottish and is in fact Australian! I booked my flights via SkyScanner, flying from Glasgow to Heathrow, then Heathrow to Reykavijk. There is only one direct flight per week to Reykavijk from Scotland – oddly. I flew with British Airways and Icelandair. I have not had much luck flying to Heathrow in the past. I think every flight I’ve had there has been delayed or cancelled! Anyway, a one hour delay turned into a six hour delay meaning I would now be late for my Heathrow to Reykavijk flight, arriving at the departure time. Whilst on the plane I managed to find a group of Icelandic people in the same predicament as me, they felt they may keep the gates open. We struck up conversation with me telling them how Scotland had adopted Iceland in the Euro’s after knocking out England from the competition :). We had to run from terminal 2 to terminal 5 with a fifteen minute coach tour and sprint with 20lbs plus of camera luggage on my back – still unaware if the flight had been delayed for us. Arriving at the gates we could hear the staff shouting us to hurry up – what a relief! A big group hug and we split up to find our seats aboard the plane. After arriving at Reykavijk Airport I waited for 45 mins in the baggage collection area, no sign of my bag. A visit to the help desk would reveal they were still London, brilliant! 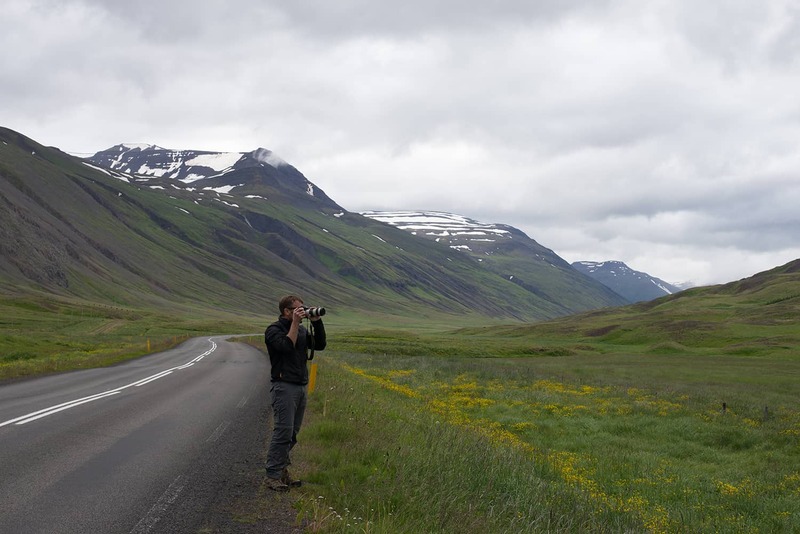 At least I had made it to Iceland but I had nothing apart from my camera equipment. They did however give me a toothbrush, some shower gel, shampoo, razor and a XXL white tee shirt? No waders or fly rods though unfortunately! I was told my stuff would be flown to me at my accommodation but would be unlikely to arrive until the second day of my trip! I headed to my hotel and borrowed an iPhone charge to charge my phone and tried to laugh it off. 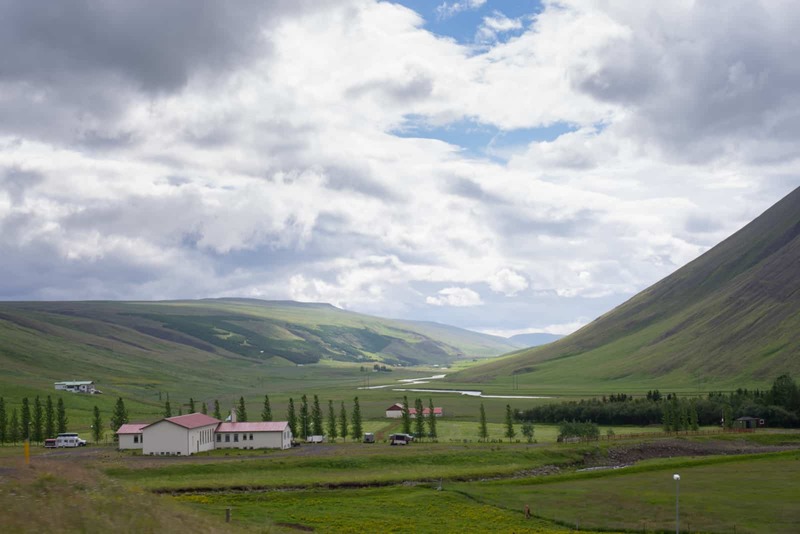 I met with Nick the following morning at my hotel before driving to the hire place to change our vehicle and collect Hamish before starting the long and scenic drive up to Husavik. 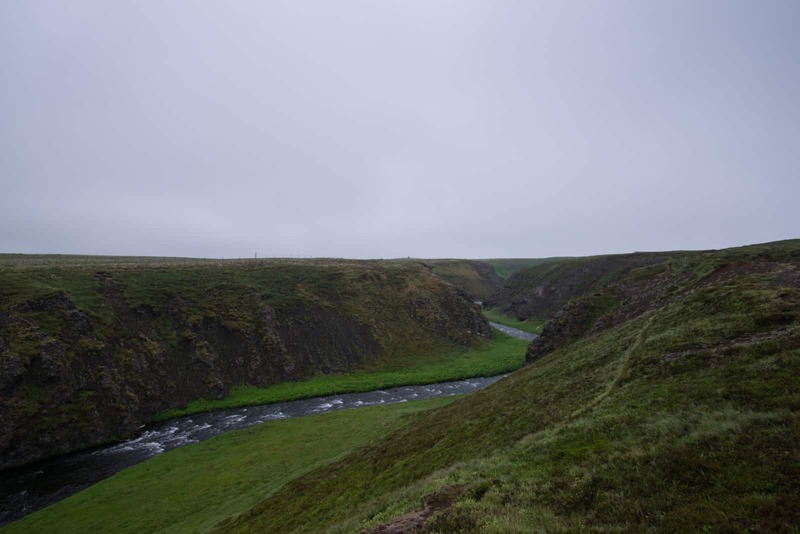 The drive was really cool, it allowed me to see of the famous Icelandic scenery. The most striking thing for me was the colour of the rivers. It is ridiculously clear and almost blue like in some places. The landscape is also very similar to Scotland in some areas. A lunch stop and some garage stops along the way quickly made me realise how expensive stuff really was in Iceland! 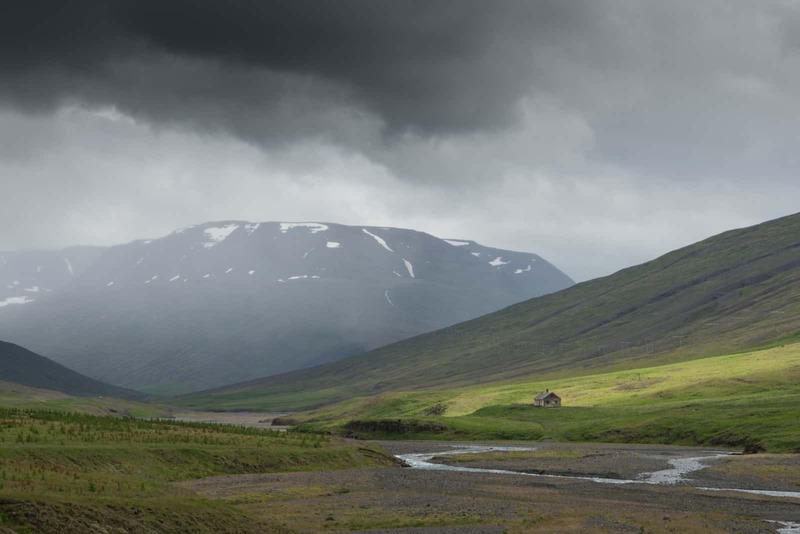 If you’re going to Iceland, be aware, it is not cheap! Alcohol prices are insane. Sorry for sounding so Scottish like, but it’s a fact! We met up with Matti at his home where we would then follow him up to our lodge by the river. We got unpacked and quickly set up all the gear rapidly in excitement at what the first session would be like! 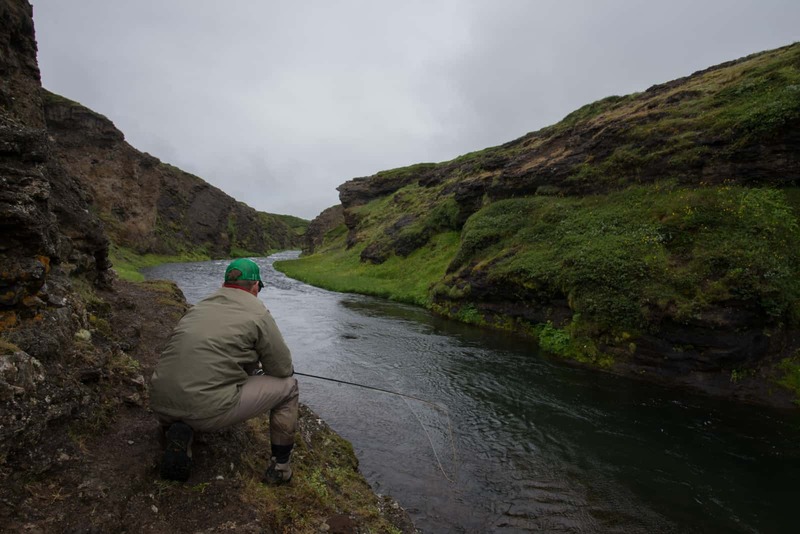 Our first days fishing in Iceland was a five hour evening session. Hamish was first up to fish for Salmon. Good news was Matti reckoned there were a few fish about, not loads but the ones that were here were multi sea winter fish in the 10 – 15lb bracket. Nick and I opted to go fishing for Trout first and on route Matti stopped at this little stream by the road to show us some Char. How fishy does that look? I had never caught a Char before and this was the species highest on my agenda! We fished for twenty minutes in this small stream and managed to hook one or two each before moving to the main river for Trout. Dropping us up river Matti told us how to fish the fly before leaving with Hamish in search of silver! It didn’t take long to suss out the Brown Trout fishing. Fishing downstream and across, streamer style I was constantly on the move, stepping, casting, swinging and twitching the fly back occasionally to induce takes. 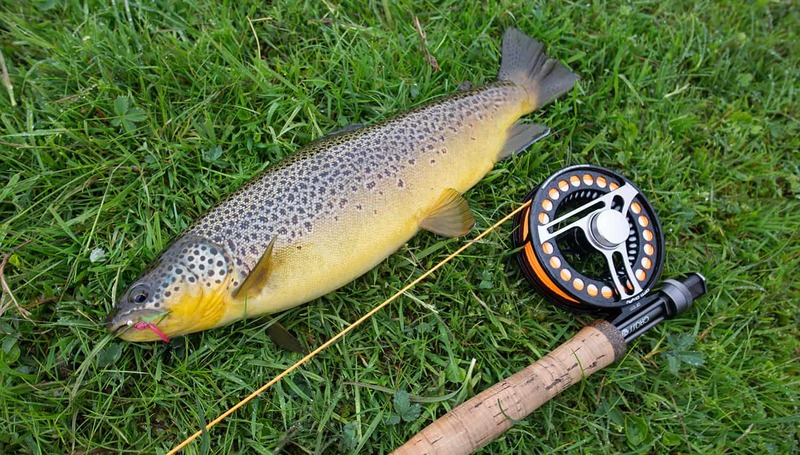 Within a couple of hours I had covered a lot of water and managed to land a number of Brown Trout up to 3lbs. Beautiful colouration on their cheeks! After a few hours Matti arrived back with a rather jubilant looking Hamish, it was clear there had been success! Hamish had managed to land the first Salmon of the trip! 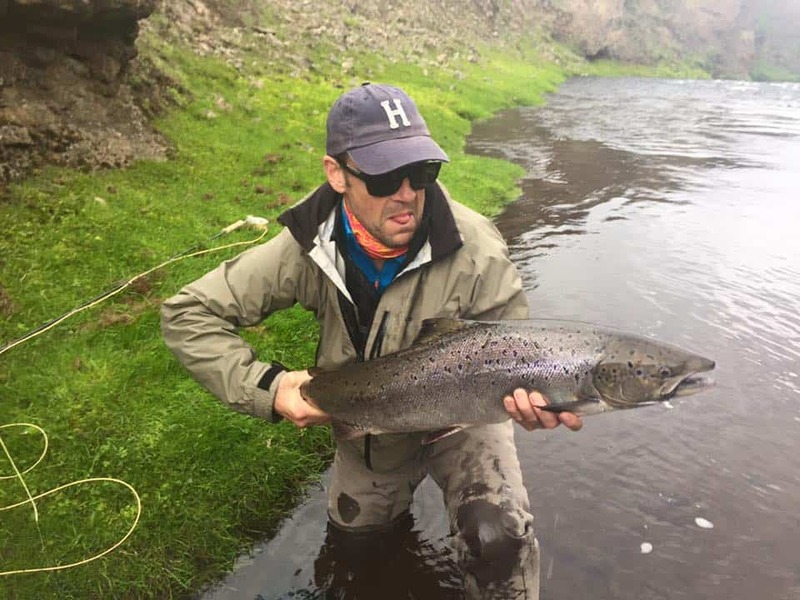 Hamish with a great Icelandic Atlantic Salmon! Hamish also hooked and lost one stripping a Monkey that session. I swapped with Hamish and headed with Matti back to the pool where Hamish lost his fish. I got into the water and warmed up with a few casts while Matti told me to aim at the boils on the far side of what was quite a slow moving pool. 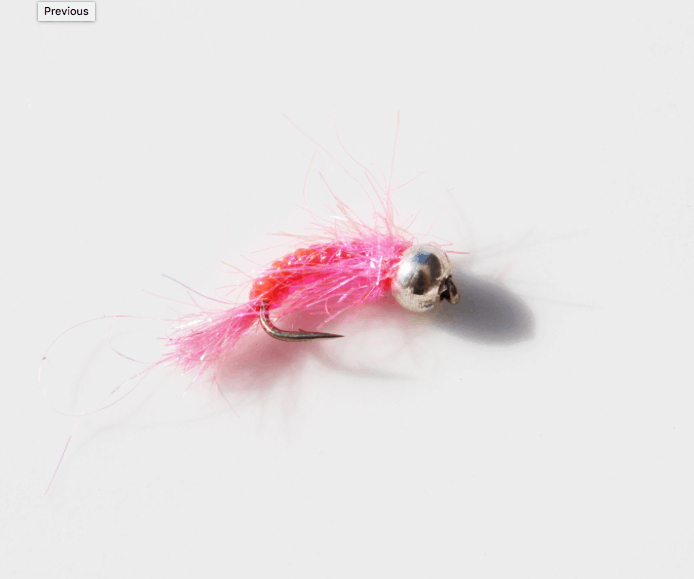 The method was to allow the line to swing slightly under tension before stripping back the fly with long, steady pulls. Within the first few casts I saw a bow wave appear and kept stripping. Suddenly a big boil broke the surface and, bang, fish on! I played the fish for no longer than a minute then it suddenly went slack. Bugger! These Atlantic’s are no different than back home! We tried some other spots that night but no other fish were hooked. Matti gathered everyone up in the Jeep and took us back to the Goat House (the name of our accommodation). 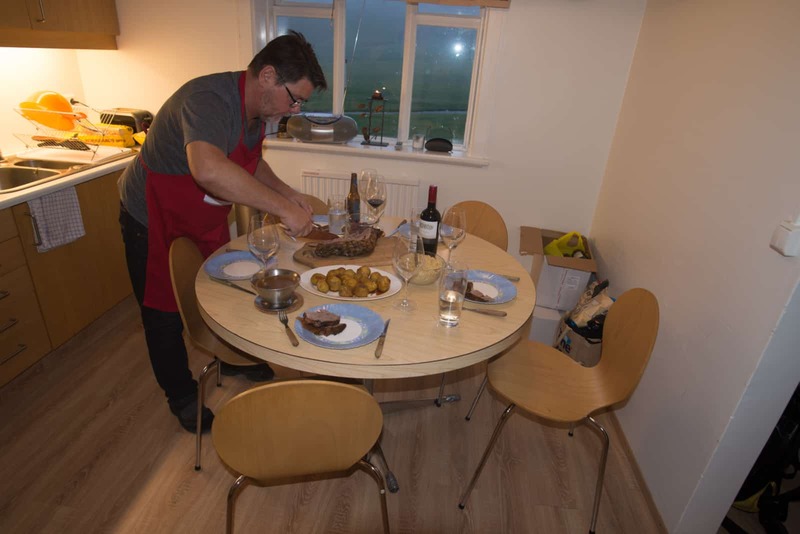 Hákon was the chef (Matti’s father) and had a meal almost prepared for us on arrival – what a great service! 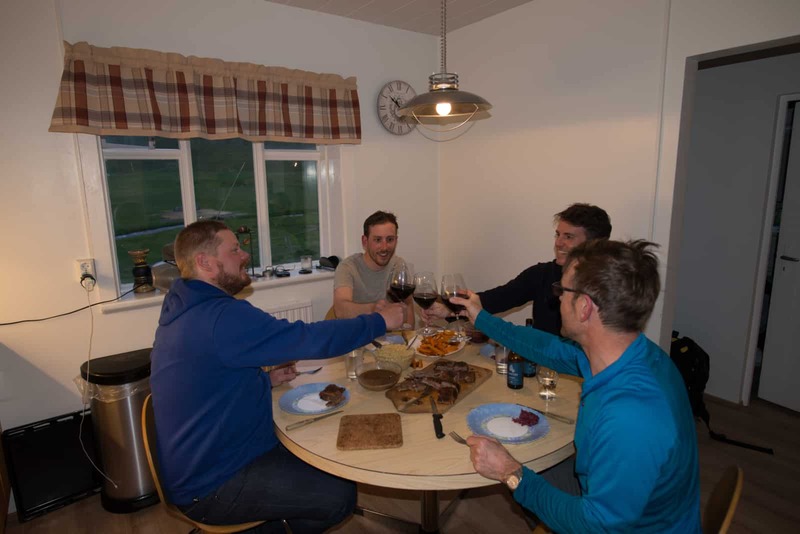 We all sat down to a fantastic evening meal prepared by Hákon consisting of Icelandic Lamb, Roast Vegetables and Hakon’s signature “gravy macaronis”. Simply immense! The meals over our times were excellent and we couldn’t fault one bit. A few wines and expensive beers were had that night as we all shared the usual fish stories and had a good banter. Matti has a great sense of humour and had us in stitches with his stories! On the second day we had two five hour sessions. The Scandinavians love to rest their rivers, so we fished morning and evening sessions allowing a break of a good few hours in the afternoon. 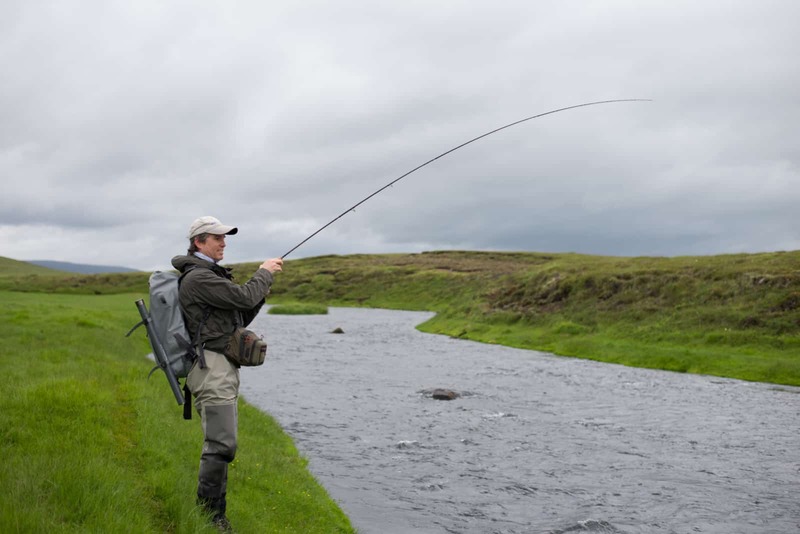 I was back out with the Salmon rod again whilst Hamish and Nick pursued the local Brown Trout populations. 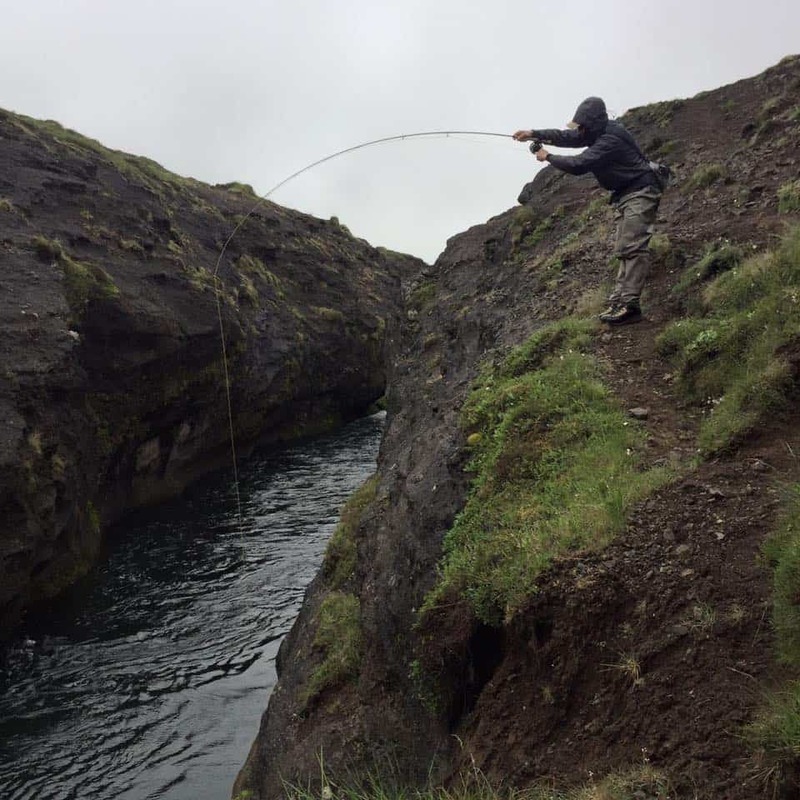 The main thing that’s different when fishing for Salmon in Iceland than here in Scotland is the fishing is done by sight 90% of the time. 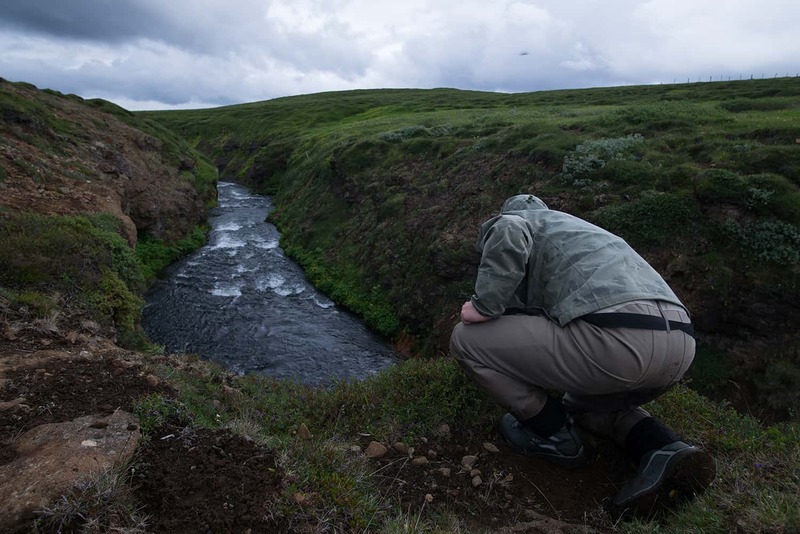 Matti would drive down the beat, stopping the jeep to go and observe from the canyons and spot any Salmon below. Matti and I spent all morning on this and didn’t come across a single Salmon. The river had risen slightly overnight and we concluded that the Salmon had probably pushed up river with the rising water. We stopped for lunch and met up with the guys who had been doing well, landing several brown trout up to 3lbs all morning. It reminds me very much of the Upper River Clyde! I was so pleased to get back to the lodge and see my belongings had been delivered! After lunch we were able to go and fish the local stream that runs by the Goat House. Matti had said this produced a few Trout, not as many as the main river but generally much bigger average size. Hamish and Nick opted for this and I chose to go hit my little favourite Char pool! With Char being a new species the novelty was not wearing off. I spent two hours in the one are catching Char after Char. Changing flies regularly I was able to keep the bites coming. To be fair any pattern worked to start with! That day the rain was relentless, sideways at times. At one point I could hardly open my fly box my fingers were that numb! It was around 7/8 degrees celsius and with the wind chill and sideways rain it felt much colder! It was like fishing in Scotland in spring – but this was summer! Matti came to pick me up with the boys to head out again for the evening session. 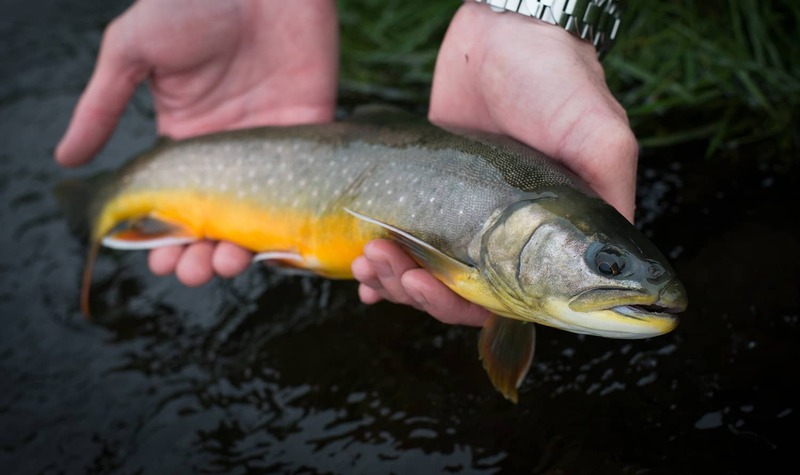 The guys had managed a couple of Trout around 5lb size – epic for such a tiny stream! Nick was now trying for a Salmon whilst myself and Hamish were left up river to harass the resident browns! Sporting the same tactics as before but with my trusty Loop Cross S1 #5 I waded out a few feet from the bank and kept casting, stepping, swinging and twitching back flies to tempt the trout. I honestly don’t recall fishing as easy as this, every where you thought a Trout would be, you would cast, twitch and bang, fish on! These Browns are well fed! To be honest after a couple of hours I was more than content having landed in excess of 40 hard fighting acrobatic brown trout up to 3lbs in weight. It was incredible sport! Eventually I met up with Matti and Nick who were keen to see how I had got on. Nick had no luck finding any Salmon, like myself earlier. He had decided to go back and fish for some browns and get some action. Hamish fancied another shot at the Salmon so I fished on with Nick and tried to get some images. The sport had slowed down as it got noticeably colder but we still managed to catch a few before calling it a night. It was back to the goat house for wine, food and a bit of craic! The last day would see us fish in the morning up until lunch time. I chose to hit the Salmon with Hamish coming along also to take turns should we land a Salmon. 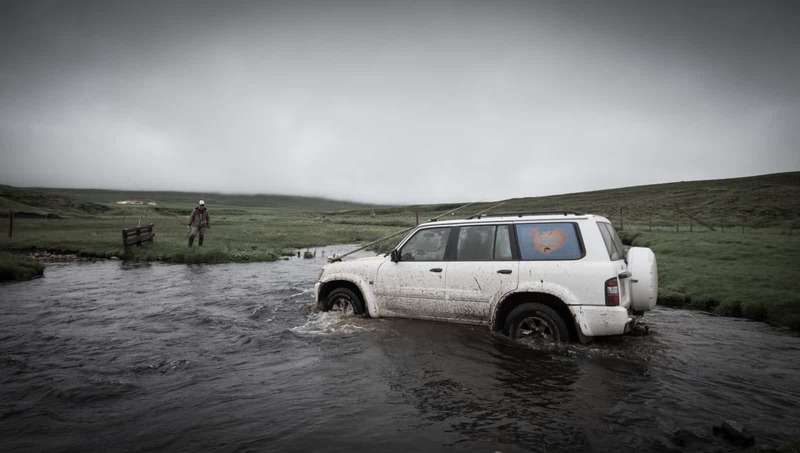 Matti drove around a couple of pools looking for fish until we found some. “Oh yes, big Salmon and one huge Trout next to it – can you see”. The Salmon then broke the surface and looked pretty clean and a fair size considering I was about 30ft plus above it. I kept myself calm whilst Matti suggested the best way to cover it. The dilemma we had here is if we go too close to the brown trout, he would take the fly and ultimately spook the Salmon. I was positioned up river 25/30ft and also above the river level another 30ft plus I had to wiggle out line from the rod tip and allow the current to position the fly past the Salmon before stripping across slightly to entice him. It was an interesting and challenging presentation. First cast I was a little short. Second cast I was in the zone and watched as the Salmon rose up for the fly twice missing it! Wow, that was pretty cool. I then thought to myself “I’ve missed my chance”. Third cast he came up missed, came back and got it! Trying to keep the leader of the sharp rocks – nasty! It was a first for me to watch a Salmon take my fly like this, I was pumped as I played this fish from a very precarious position. It was probably the most nerve racking fight I’ve had from a fish on fly. I had an audience, it was the last day and would I get another chance before we flew home? Not only that, from my elevated position I had to watch every head shake of the Salmon as it bore up and down the pool whilst rubbing its side along the sharp rocks. What was this fish trying to do to me? The fight seemed to last an eternity, it always does in these situations. Matti was top notch throughout and explained the landing technique! Once the fish was tired I had to allow her to fall back with the current to the end of the pool where Matti was with the net. We got her close too early and as soon as she saw Matti’s face she shot back into the neck of the pool again up the canyons – who could blame her? Second time she turned and slowly came down stream and I knew this was the right moment and tried to guide her slowly towards Matti who had no trouble getting her at first attempt. 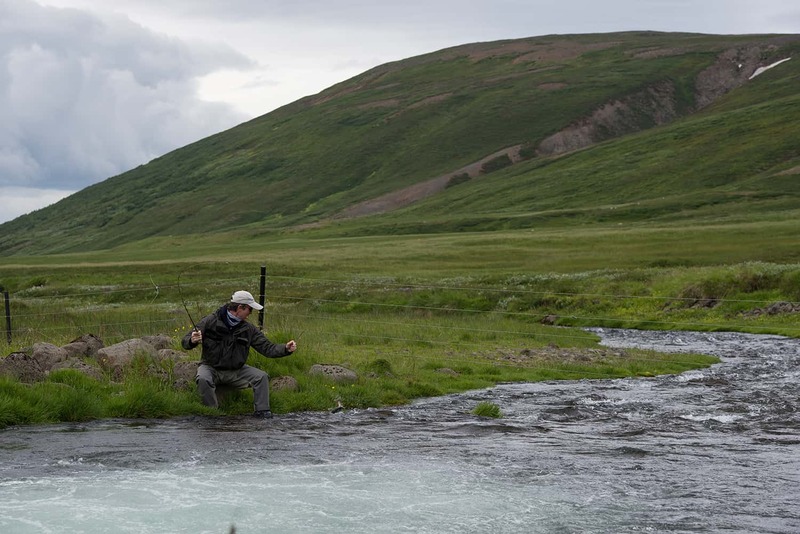 What is a Salmon fishing in Iceland trip without the obligatory grip and grin? Weighing around mid teens I was very happy with this Salmon on a single handed fly rod. It had a missing adipose fin and what looked like nets,seal or porpoise damage but it did not detract any of its beauty for me. A Salmon, is a Salmon in my eyes! I was more than stoked to end on a high and give the rod up to Hamish. We searched on for the last hour or so looking for another Salmon but never came across any. It was time to meet up with Nick who had spent the remaining morning chasing browns then headed back to the lodge for the final time. Packing up our gear we then said our goodbyes to Hakon and Matti thinking them for their hospitality and making our fishing in Iceland experience so memorable. Hopefully we get to meet again sometime in the future. I’d love to get Matti into a Tay springer! We all headed back down the road taking our time to absorb the scenery and reflect on what a great few days we just had. 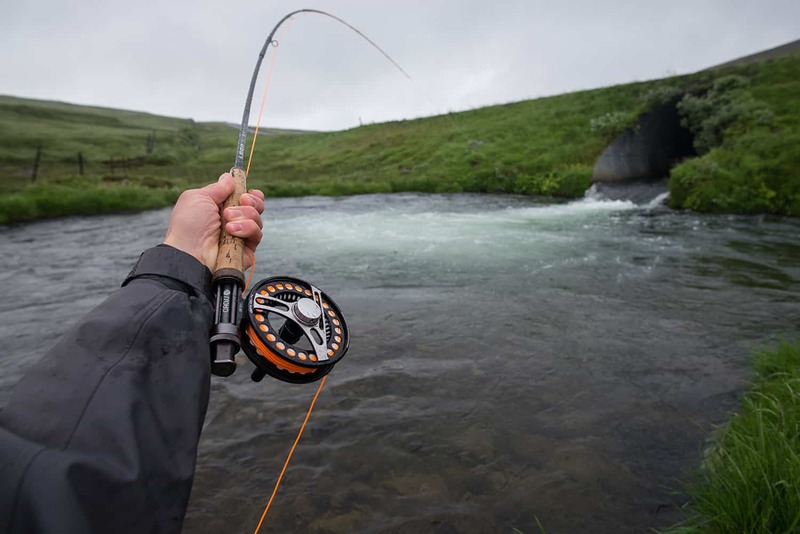 The drive is spectacular for a fisherman as you get to wonder whats in every river you pass. 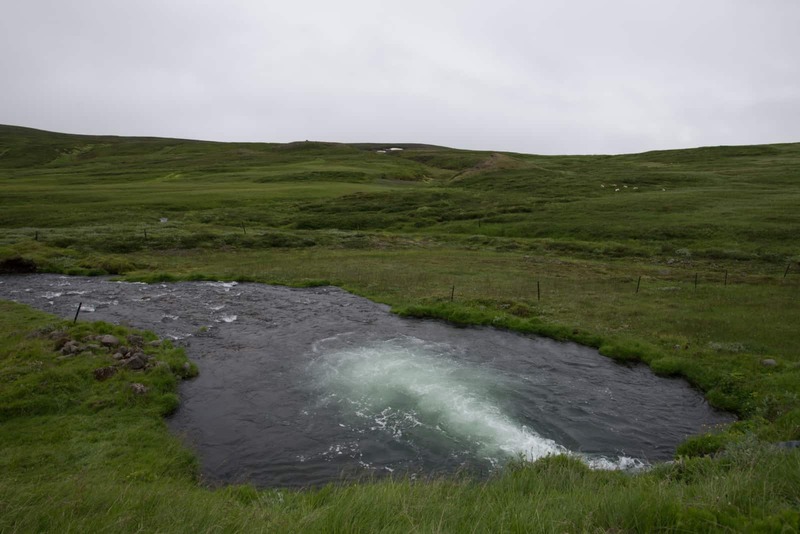 We did see quite a lot of fisherman on both journeys and watched one angler land a Salmon below some waterfalls! We also decided to stop by Lake Myvatn and seen some geo-thermal activity. It’s like being on Mars as sulphur bubbles out the ground, shoots of steam and water bursting through the ground creating a warm humid air. It’s so bizarre and definitely worth seeing. We arrived in Reykavijk for the last night before flying out early the next morning, we loaded our stuff into our accommodation then went out for some dinner in the city centre. The next morning I dropped the guys off at the airport and took back the car to the hire shop before catching my own flight home to Glasgow – which was on time by the way! 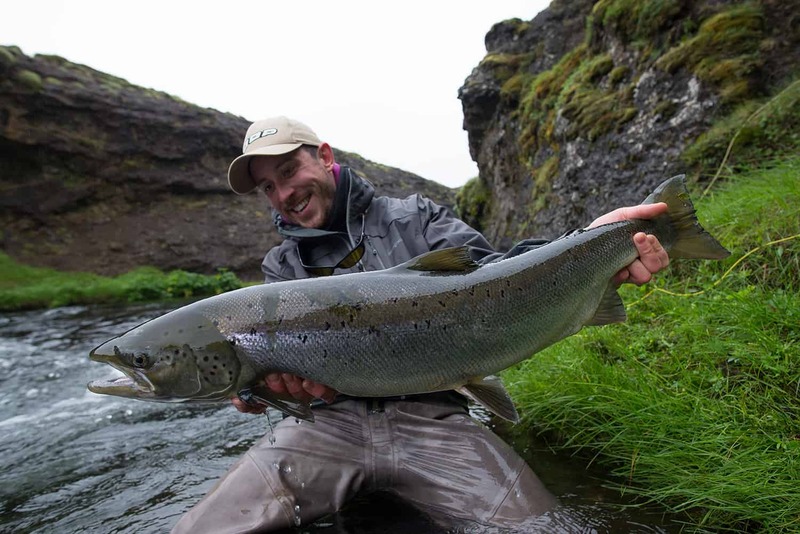 For anyone thinking of fishing in Iceland, I would thoroughly recommend fishing with Matti from Iceland Fishing Guide. They’re very reasonably priced for Iceland fishing. 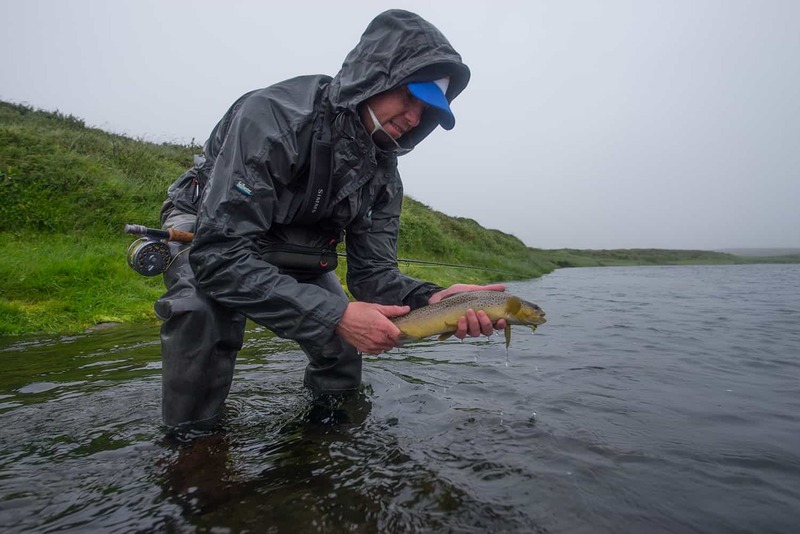 Matti’s a great guide and host who will do his utmost to get you into the fish! 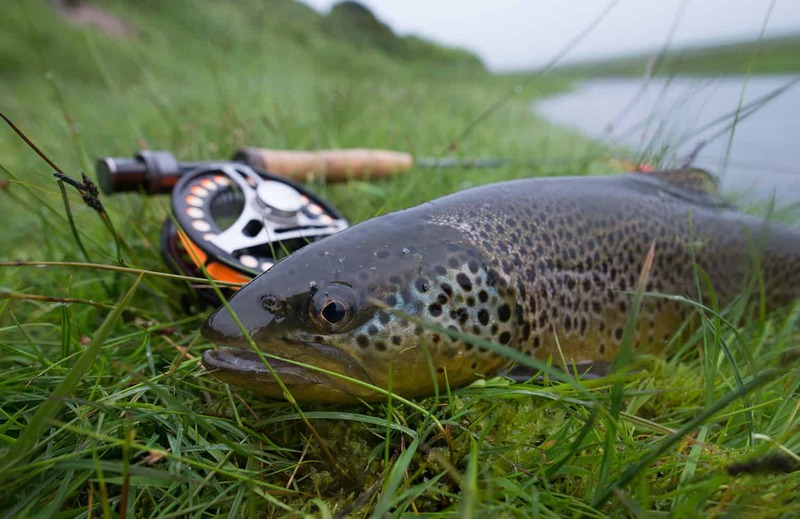 The River Tweed Trout Fishing Season Starts Today!